The best part? The PatentPlaques.com team was chosen to produce the awards given to each recipient. 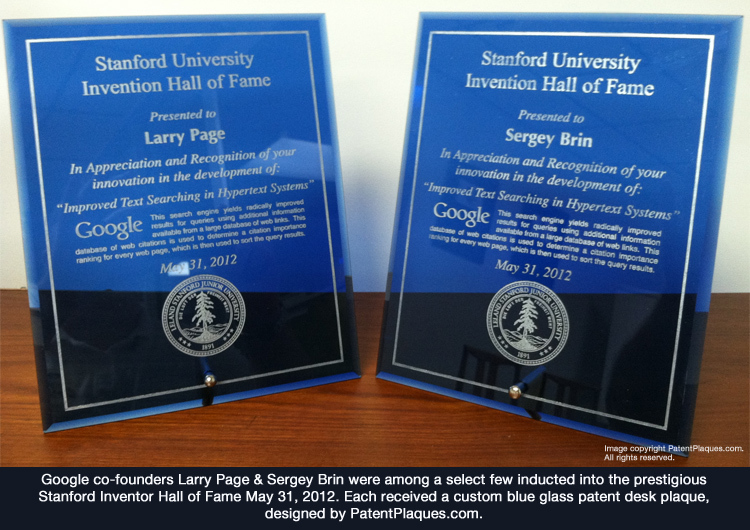 The blue glass patent plaques awarded to Inventor Hall of Fame inductees were each produced by the PatentPlaques.com production team. It may not sound like a big deal – sure – we make ip awards for corporate and institutional intellectual property holders every day. But this Geek was admittedly beside herself when she saw Page and Brin’s names on a few humble pieces of glass back on the production line. Of course, just because I got a little starry eyed about two particular names doesn’t warrant other inductees any less merit. You may not know, but the Stanford Inventor Hall of Fame is so exclusive that before 2012, only 17 other members had been inducted in the Stanford Office of Technology Licensing‘s 42 years of operation. Inductees not only have developed their invention as Stanford (as faculty, students, or staff), but their inventions or process must be deemed commercially viable and earn the university a minimum of $5 million in royalties over time. We all know how difficult it is to get an idea to work, much less get it to be successful. Earning a place in the Inventor Hall of Fame is no small feat for any person, and to think we had the opportunity to help recognize each of those great minds, is an honor. Indeed, any chance we get to help recognize those creative minds which improve our world in countless ways – any of it is an absolute pleasure.